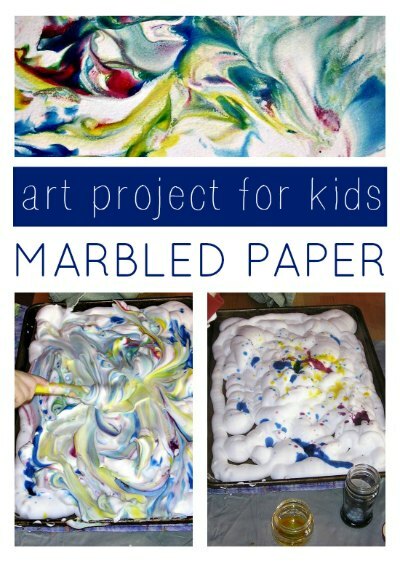 Here is a fun, sensory art project for kids that I’ve seen all over the internet – making marbled paper with shaving cream. If this is your first introduction to it, you are in for a treat. Kids can make a mess and stir things up but the end result is always satisfying because the more imperfect the marbling the more beautiful the art. Baking pan. We used an old pan, but you could wrap the pan in foi. Droppers. These pipettes are a staple in our art supply cabinet. Liquid color. We prefer liquid watercolors , but you could also use food coloring. Fill a baking pan with shaving cream. Squirting out a mound of shaving cream is always a fun start to any project for kids! Using pipettes, drop liquid watercolors all over the cream. You could also used food coloring. Then, using a wooden craft stick or plastic knife, swirl, swirl, swirl. Stirring the colors may just make a muddy brown mess, watch closely and stop the action if your kid gets a bit carried away. Or, just let it go and see what happens. Either approach is fine, really. Process not product, right? Press — or “smush”, as Kiddo said — heavy paper on top of the shaving cream. We used watercolor paper. If you have overloaded on the shaving cream (as we did) you can pour out the rest of the paint (“Why bother with the dropper?”, says Kiddo) and do more. Remove paper and let dry for 10 minutes. Remove shaving cream. At first I used paper towels but that smeared the color so I had the brilliant idea of scraping it off with a spatula. I was holding my newborn at the same time so a spatula was easier for me anyway. By this time your sinuses will be nice and clear from all that chemical menthol fragrance. That’s it! Enjoy the fruits of your labor! (or your kid’s labor). You can either frame it as is or use the gorgeous paper in other crafts. We used some of our paper to make a birthday card for Grandpa D.
OK, you are a mama extraordinaire, b/c that project looks COMPLICATED. Also MESSY. Involving MULTIPLE STEPS. Also? You actually have watercolor paper in your house. And you’re doing all this with a newborn in your arms. Sigh. I can’t compete! Truthfully, it wasn’t as messy as it could be for kids who are not inhibited about getting slimy shaving cream on their hands. Kiddo doesn’t like to get his hands messy, which is actually more annoying than it sounds since he demands constant hand wiping. Also the paper was a hand me down from a neighbor who was moving and has been sitting in the closet for 3 years! Plus, the baby didn’t wake up until it was time to remove the shaving cream, which sort of meant that I felt I was racing against time for most of the activity. So you see, I was skillfully able to make myself fabulous when really I am just scraping by like the rest of us…. to see an easy project for kids. Pop-up book artist, Robert Sabuda shows kids how to make a pop-up card. It’s easier and cleaner than shaving cream. What a GREAT looking!! This method is easier. This is a great art project. Will try it soon, thanks so much for sharing. To everyone worried about mess: We did this with 40 toddlers at a summer camp and all we did was take it outside and put big t-shirts on the kids as smocks, then we hosed everything off. It was much less messy than it would appear upon first glancing at the project. You're welcome! I agree that it would make great wall art. Thanks for your comment.